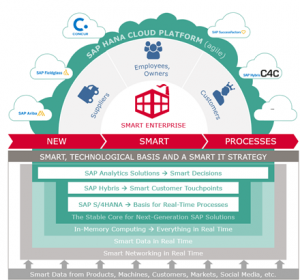 SAP S/4HANA is an essential component in the digital transformation of many SAP customers. But it is not the only one. This blog post explains why the SAP HANA Cloud Platform is also important for enterprises who have yet to pursue a cloud strategy. In the past, IT was mainly about increasing the efficiency of processes. However, many organizations have now already exploited every opportunity for optimization—and the cost of any additional improvements would outweigh the profit. For this reason, it would be inadvisable to regard digital transformation primarily as a way of optimizing business. Instead, it should be seen as a means of transforming business. Service providers are increasingly replacing traditional manufacturers. Organizations that embrace this shift can reinvent their business—before it gets driven out of the market. There are already a number of successful examples. For this principle to work, it requires a central platform that integrates on-premise and cloud applications. Or, as Lorenz Beckmann puts it, “the glue that holds everything together”. The SAP HANA Cloud Platform is this glue. It connects everything, including business-critical applications such as SAP ERP or the new SAP S/4HANA business suite. But it also connects to the “agile cloud layer”—flexible applications based on open web standards and primarily designed for networking. These include SAP Ariba, SAP Fieldglass, SAP SuccessFactors, and Concur solutions, as well as SAP Hybris Cloud for Sales. In-house or modified software can also be integrated. “With the SAP HANA Cloud Platform, you can now tailor a wide variety of standard solutions to your individual requirements,” says Beckmann. This is an argument that takes the wind out of the sails of many cloud sceptics, as the “take it or leave it” policy is no longer valid. Moreover, the platform comes with various services that facilitate the seamless integration of in-house developed applications with other IT systems, such as centralized authorization management. “On top of all that is the SAP Fiori user experience. Users always work with a consistent, modern look and feel and don’t even notice that various customized solutions are running in the background,” says Beckmann. The one thing that digitization does not change, however, is the way an enterprise works internally. The Internet of Things (IoT) gives rise to new partnerships with suppliers, service providers, and customers, for example. Manufacturers, users, and service technicians exchange sensor data with one another, and everyone profits. The SAP HANA Cloud Platform functions as an interface for this, too—including dedicated access authorization to specific content. Von Hause aus Wirtschaftsingenieur ist Lorenz Beckmann seit 1997 in der IT im SAP- und Non-SAP-Umfeld tätig. Dort hat er sich – aus den Prozessen kommend – über Analytics hin zum In-Memory-Computing mit SAP HANA entwickelt, für welches er seit seit 2009 einsteht.